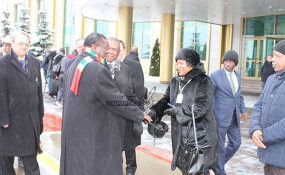 President Emmerson Mnangagwa is introduced to Zimbabwean Embassy staff in Russia by Harare's top diplomat in Moscow Ambassador Nicholas Sango. The new retail prices are $3,31/litre (previously $1,34) for petrol and $3,11/litre (previously $1,49) for diesel. Last night, President Mnangagwa said: "The recent price increase was necessary and remains necessary. In our region, before two days ago, the price of fuel was about 60 (US) cents per litre, the lowest in the region. "We have now brought it to the level of about US$1,30, which is the average in the region. The level of 60c per litre, even surrounding consumers of fuel would find it cheaper to come into Zimbabwe to access that fuel. "As you are aware, we depend on hard currency (to buy fuel) which we do not produce, but (which we) earn through exports. So we have very limited capacity in acquiring hard currency. But we have enough hard currency resources for our domestic market. "At the level at which now we have priced our fuel, it will stabilise the aspect of fuel filtering to neighbouring consumers." "You must realise that Zimbabwe is going through both political and economic reforms. These do not come easily. We have introduced austerity measures and it will take time for things to settle and results to show that this is where we must go to grow our economy and improve the lives of our people," President Mnangagwa said. "You don't liberalise where there are challenges like we have in our economy where the official rate is competing with what obtains on the parallel market," said Dr Mugano. "Because of the difference in the official rate and the parallel market, you are bound to have rent-seeking behaviour where people take advantage and abuse facilities such as the ones we have had for fuel. "So because we still have that difference in the official rate and the parallel market, chances are that we will still have distortions which corrupt people will seek to exploit. So it is very important that we have a thorough investigation of how the previous facilities have been used," said Mr Mugano. "Once we get proof of corruption, which I am sure is there, we must fish out the culprits so that we won't have the same problems on future facilities, be they for fuel or any other essentials," he said. Another economist, Mr Persistence Gwanyanya said there was need for the Government, in light of the President's call, to relook at how such facilities were managed. "The fact that a need for investigation has been suggested is a sign that there is serious doubt on the conduct of the institution that is at the centre of these allocations," said Mr Gwanyanya. "What it does is to simply question the RBZ as an allocator of foreign currency and or these fuel facilities," he said. "Given that the RBZ has been key in allocating foreign currency to companies (fuel dealers), it should also be audited alongside the firms that benefited from the funds. "If indeed State resources were abused, Government should not hesitate to send people to Chikurubi. Zimbabweans were deprived of quality health and life because someone abused his/her public office. That should end for Zimbabwe to move forward," he said.